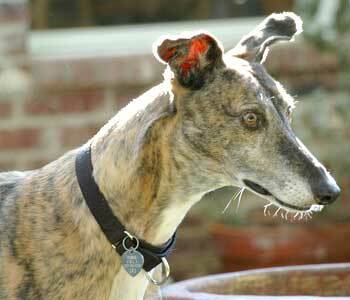 Phoebe is a cute, approximately 8-year-old female dark brindle greyhound with big eyes and no tattoos. Very sweet and enthusiastic, Phoebe loves people and does very well with children. She gets along well with dogs (big and small), but she does not appear to be cat tolerant. 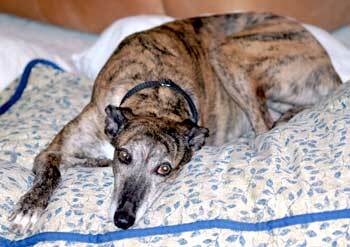 Phoebe was found as a stray in 2004, and was heartworm positive. After going through three treatments, she was declared negative. Soon thereafter she was adopted; but it was not to be her forever home. Phoebe's owner started nursing school, and Phoebe was returned because she could no longer spend enough time with Phoebe. When Phoebe was returned, her foster family noticed a growth on her right rear lower leg, just above her foot. Dr. Jeff Ellis performed a biopsy, which indicated the growth should be removed as soon as possible. Within 2 weeks that occurred, and the growth was excised as much as it could be because of the location. The pathology report revealed a spindle cell carcinoma most consistent with fibrosarcoma. 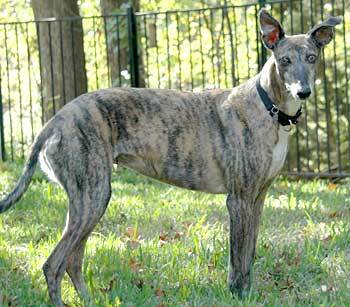 Dr. Ellis referred Phoebe to Dr. Caeley Melmed of the Animal Diagnostic Clinic in Dallas. 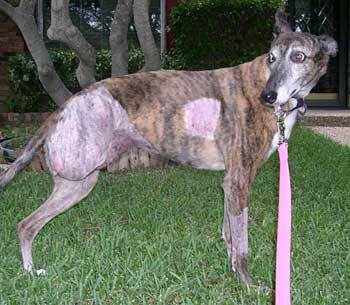 Dr. Melmed and her staff consulted on Phoebe, and because there is little room for the complete excision of the mass where it is located, amputation is the most feasible route to fully remove the mass. It is felt that Phoebe will not require any radiation or chemotherapy after the amputation, and she can lead a full healthy life. Her surgery is scheduled for Wednesday, July 5. 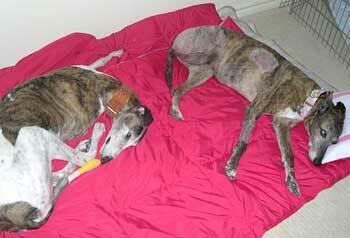 In addition, Phoebe has a condition called plasmoma, which is a third eyelid variant of pannus. To keep the condition at a maintenance level, Phoebe requires lifelong treatment. The estimated annual cost of her medicine is $300-$350. Phoebe's surgery was performed on July 6, and Dr. Ellis was very, very pleased with the results. She stayed in the hospital for two days, and was sent home to recuperate where it was definitely quieter. It has taken Phoebe a little while to get adjusted, as she, unlike Marty, was still using her leg. She is one brave and determined little girl! Each day she is becoming a little less wobbly in her hopping around. Her appetite is good, and her eyes are getting brighter, so we know she is feeling better. Her staples will be in for at least 10 days, and she will see Dr. Ellis again at that time.